Watermark University (WU) strives to provide individuals with meaningful opportunities to learn, teach, grow and achieve wellness. Research shows that learning and keeping our mind active and sharp supports healthy aging. At Watermark Retirement Communities®, we are committed to encouraging our residents and associates to lead balanced lives, full of meaning and purpose and grounded in self-awareness and infused with curiosity. Our Watermark University classes help us achieve this goal. By focusing on the seven dimensions of wellness — physical, social, intellectual, spiritual, emotional, environmental and vocational — we offer individuals the opportunity to experience a balanced life. We see the benefits across the country in every class, every day. Download this semester’s catalog below, mark your calendar with some favorites, and plan to join us. We look forward to seeing you in a Watermark University class this semester! 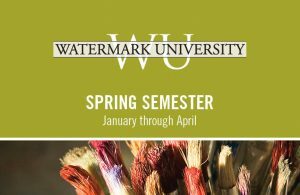 » Click to view the Spring 2019 Watermark University Catalog.